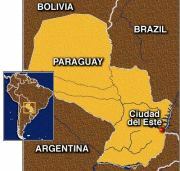 Speculation is rising as to what the Bush plans are for a 98,840-acre ranch recently bought in Paraguay, protected by a nearby, semi-secret U.S. military base - with some 500 military personnel having been granted exemptions from war crimes prosecution by the Paraguayan government (Scroll down to story #25.). Speculations range to everything from another secret interrogation site to thoughts of eventual conflicts over water rights and recollections of where the nazis ran off to once their regime collapsed. Steve O, over on Bring It On!, does a quick job of ticking off the key links to get matters rolling, while Wonkette starts at Steve O's piece and runs with it at length. It's a bizarre, oddly entertaining development, including the bits that appear to show 24 year old Jenna Bush possibly acting as an agent for the family, though she had UNICEF as a reasonable cover story. The thought of el Jefe and entourage potentially fleeing as war criminals is a tad too delicious an aroma for me to bite the bait -- currently placing it in the too good to be true section -- but something's definitely brewing.